When WPI’s eProject-2.0 system debuted, its framework provided long-awaited services to help students navigate all the options within projects, make the system run smoother, and enhance the impact of WPI’s work. 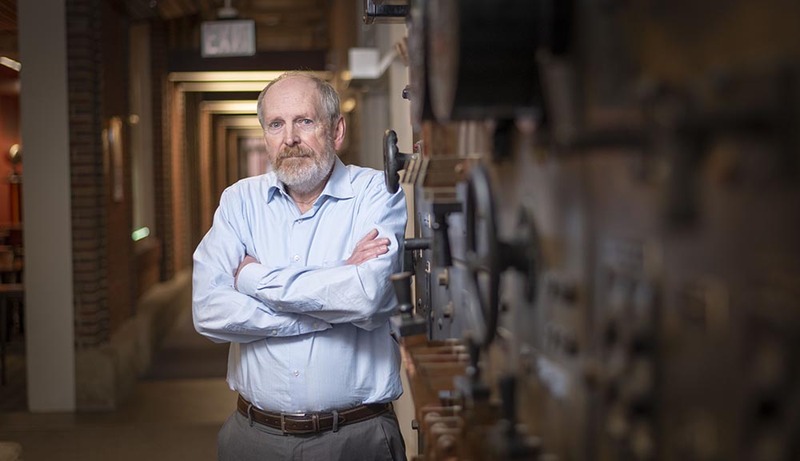 Although his modest manner defers eProjects’s success to his team and the collaboration between several departments especially IGSD and the Gordon Library, Bob Brown is the driving force behind the technical and highly complex infrastructure project. eProjects allows the many facets of WPI’s extensive project-based learning approach to be linked, making possible everything from finding an MQP project using a mobile device to comparing domestic and international IQPs to sharing final project results. The process is not only simpler, but is now infinitely more accessible, and the student work is easier to find and retrieve. After so many years of working with the WPI Plan, Brown knew a piece was missing: making connections between projects. Always thinking of ways to help students and the important work they do, his thoughts continued to churn until he found a way to make it happen. Brown collaborating with Derek Murphy (seated) and Mark Santiago (on screen). Now eProjects connects parallels in projects that could spark new collaborations. For instance, a project in San Juan investigating water resources and a project examining soil in Morocco might have connections that amplify existing or future research. He is thrilled at the thought of students and advisors being able to access information and then use it in ways that were previously impossible or cumbersome. It is clear eProjects is getting results. “This year, more than 70 students applied to the IGSD program while at the Global Fair using eProjects 2.0 on their smartphones,” he says. Those connections are so essential that Brown says he moved the team to Atwater Kent to be closer to the students and faculty. “We want to encourage interaction and collaboration and develop a better understanding for what people need,” he says. Especially at home in the energetic environment of a college campus, Brown is known to many as a go-to guy for complicated and complex infrastructure design. He likes the challenge.